So how does a company spend the hundreds of billions of dollars of cash it has on hand? 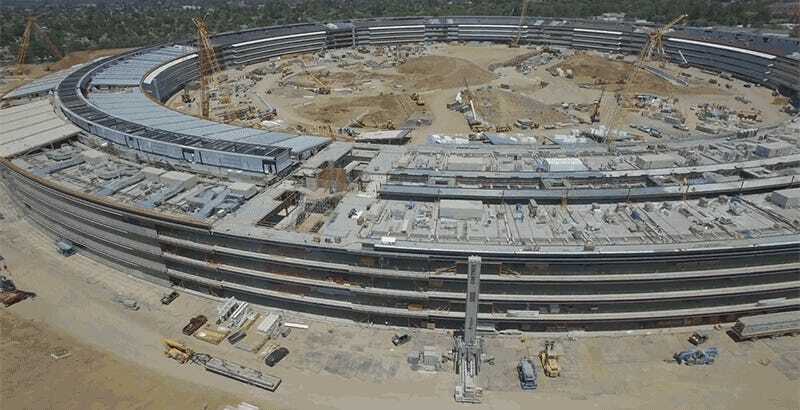 It builds itself a fancy new headquarters, and the latest drone-shot flyover of Apple’s new HQ reveals the truly immense scale of not just the central spaceship building, but of the entire new campus. Shot using a DJI Phantom 3 Professional and edited by Matthew Roberts, this new footage of Apple’s forthcoming fortress HQ reveals progress on its 100,000 square-foot corporate fitness center, 200,000 square-foot parking structure, and the massive solar panels that will eventually be lifted onto the roof. Marissa Mayer recently revealed that carefully planned bathroom breaks can make it easy to work 130 hours every week, but if you end up being one of the 13,000 Apple employees who will be moving into these fancy new digs once they’re done, it looks like there could be everything you need to spend all 168 hours of your week at work. Hooray?